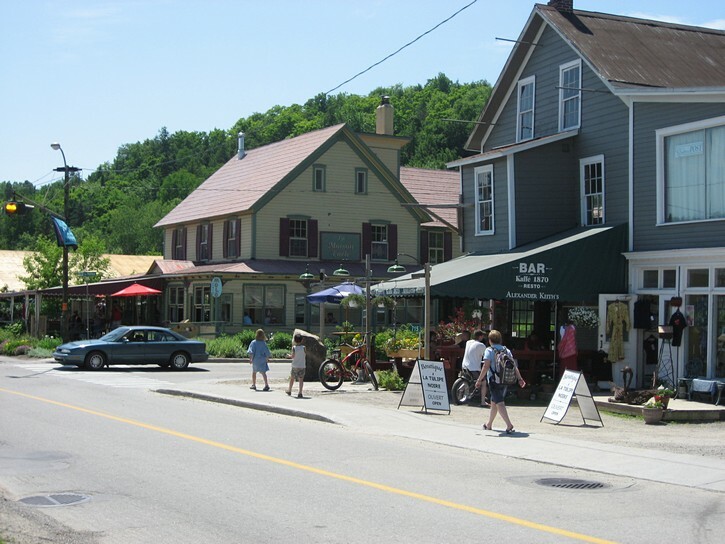 Wakefield is a picturesque little town situated on the banks of the Gatineau River, and one of the more popular tourist centres in the vicinity of the National Capital Region. 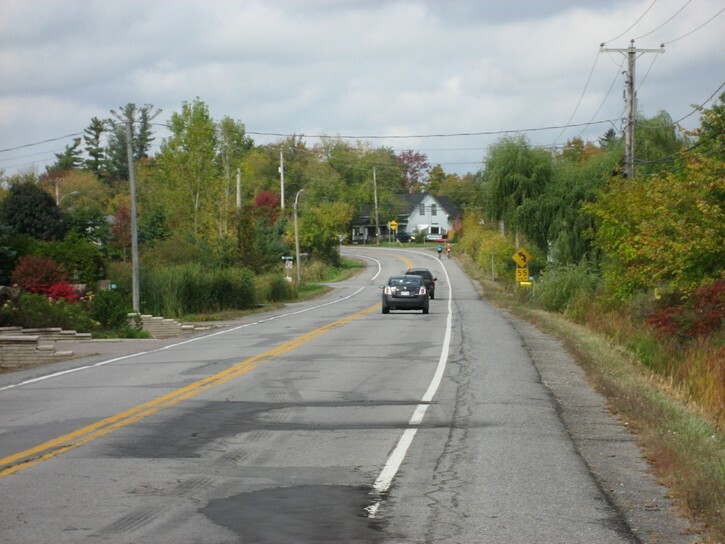 It is in relatively easy cycling distance – depending on your departure point – about 40 kilometres from Ottawa’s downtown core (or 80 km both ways). This means a return trip to Wakefield would be a fairly long day ride, but the town can also serve as a convenient overnight destination when planning a two day trip. 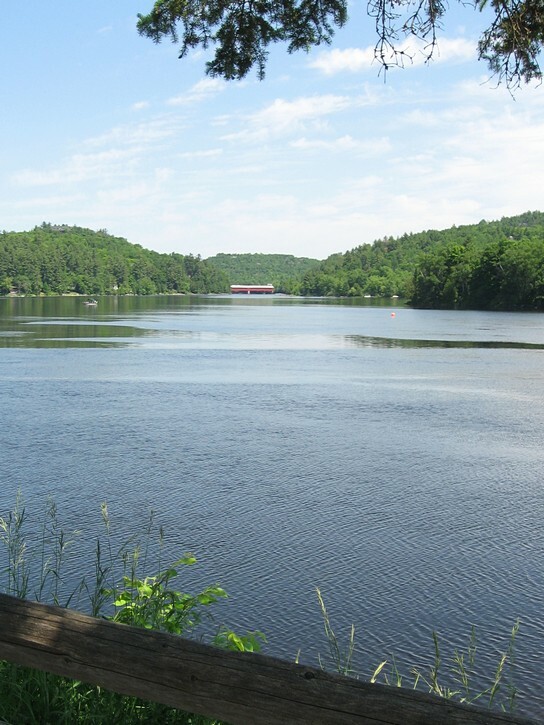 Wakefield is a major tourist draw because of its scenic location along the Gatineau River, and it comes complete with a quintessential view of a covered bridge. 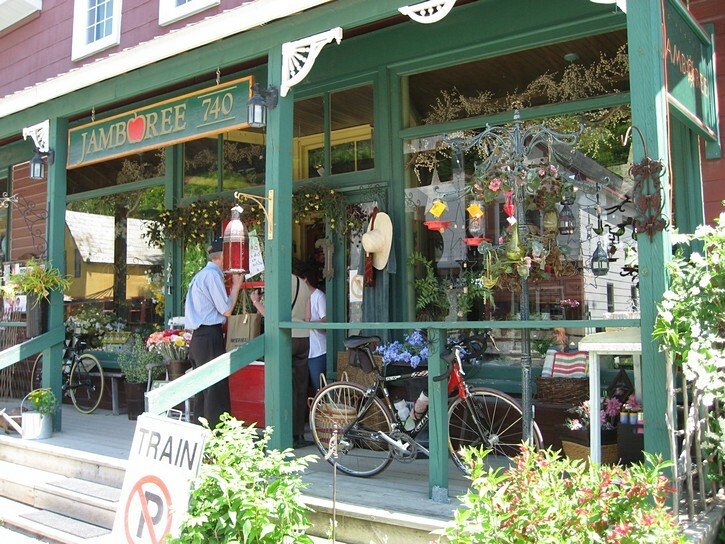 Since much of the town caters to tourists, Wakefield has the usual assortment of restaurants and boutiques. 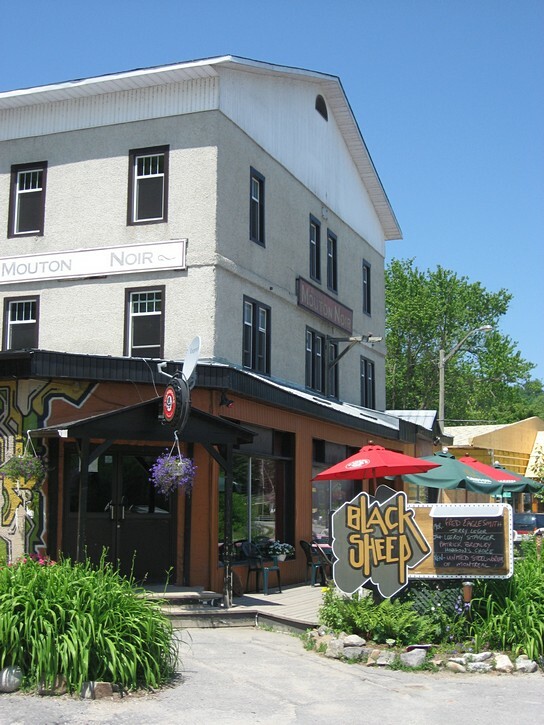 This includes the “Blacksheep Inn” (Auberge Mouton Noir), which houses a bar which has gained a reputation for being one of the country’s best live music clubs. Options for overnight accommodations include several bed & breakfasts (B&Bs), at least one hotel, and the renowned heritage inn located at the restored Maclaren Mill. No description of Wakefield would be complete without a mention of the region’s famous steam train. 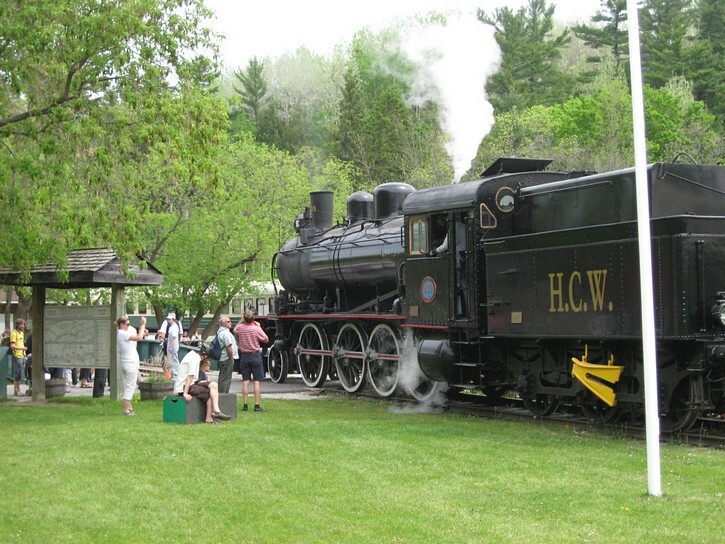 It’s one of Canada last operating steam engines, and it made short excursion trips daily between Gatineau and Wakefield during the peak tourist season. The steam train suspended operations in 2011 after part of its rail bed was washed out during a heavy rainfall. There was talk that the train might resume operation in a couple of years, but with a repair bill of at least $5 million to replace the missing track, this seems increasingly unlikely. 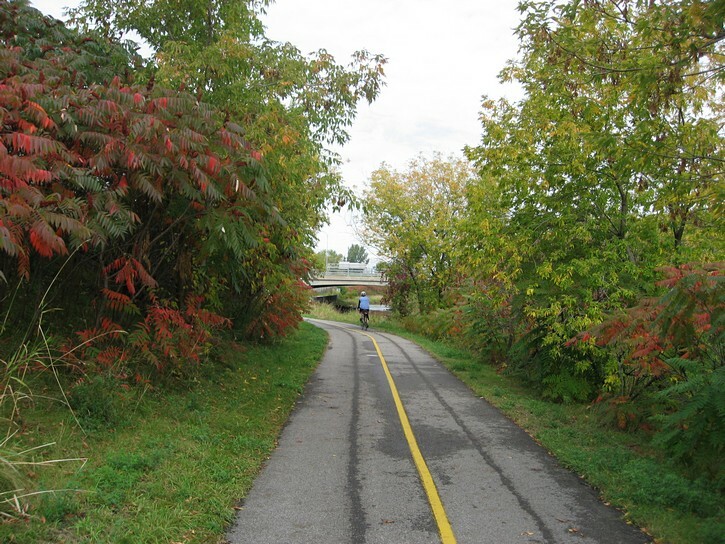 A proposal has been floating around to turn the train track to Wakefield into multi-use bike trail, and there are reports that the steam engine might now be used for a new service between Gatineau and Montebello. Although the bicycle ride to Wakefield isn’t very long, some people may find that the route for getting there can be a little challenging. Much of it takes place on roads, and there are a few long stretches where there are no paved shoulders. Fortunately, most of these roads aren’t overly busy, with the possible exception of a brief flurry of traffic during the morning and evening rush hours. 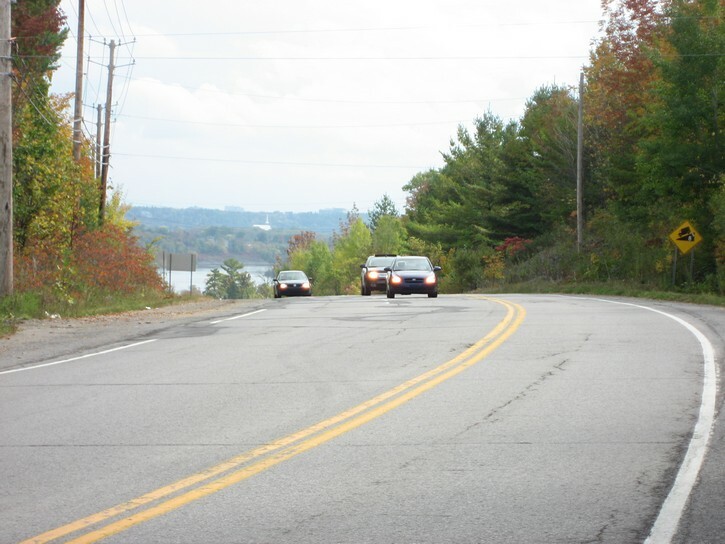 In addition, there are a few areas where you will encounter some real hills, especially shortly after leaving Gatineau, and just before arriving in Wakefield. These hills are not as big and nowhere as numerous as what you might find when cycling to the Champlain Lookout in the Gatineau Park, but they will probably test your fortitude for climbing. Fortunately, the rest of the route is relatively flat. 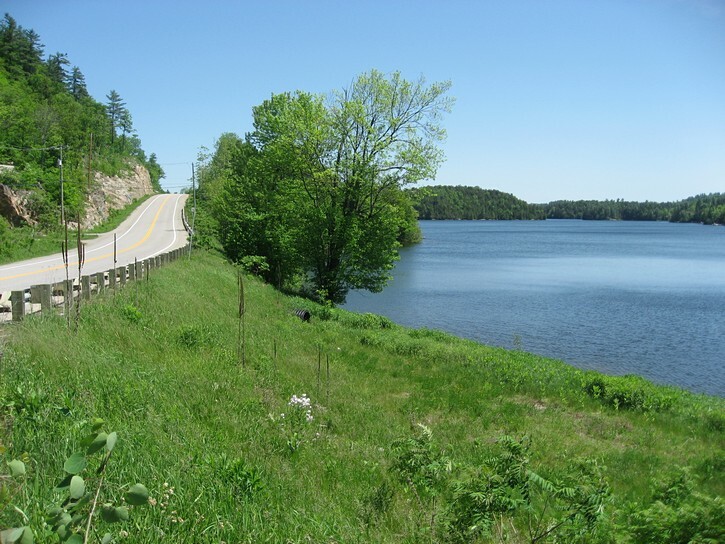 In a nutshell, the route for getting to Wakefield is to follow the Gatineau River by cycling north along Highway 105 (a secondary two lane highway with a paved shoulder). There’s also the option of taking Chemin de la Riviere for the last third of the trip. If you are departing from downtown Ottawa or the east-end of the National Capital Region, you’ll probably want to head towards the Gatineau River Pathway in the area behind the Lac Leamy Casino. The NCC bicycle map shows several ways to do this, but be warned that the pathways around Lac Leamy can be very crowded on nice weekends. 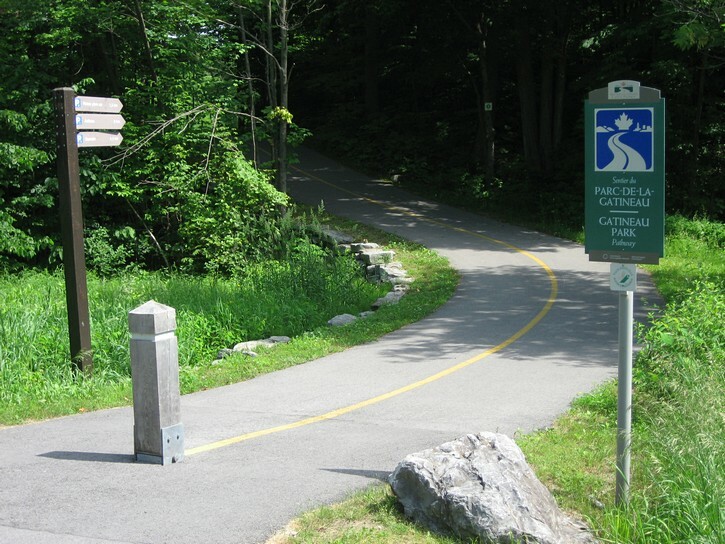 The Gatineau River Pathway runs in a northerly direction and will soon bring you to the 105 (also known as St-Joseph Boulevard within the City of Gatineau). 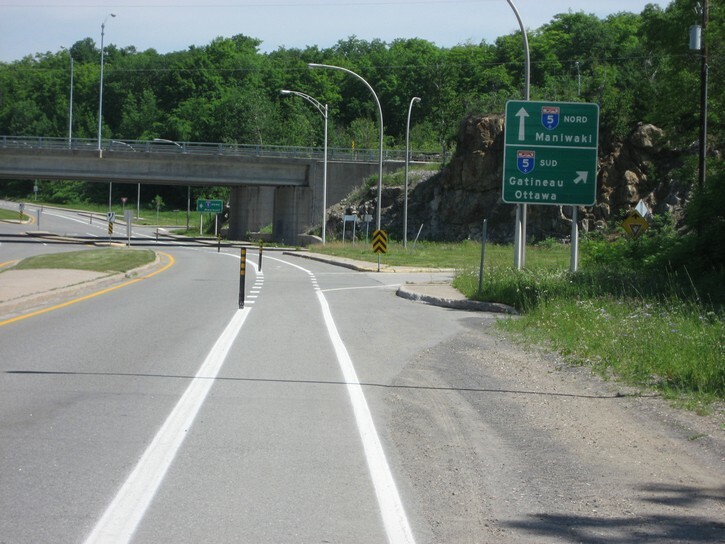 After cycling through a nice park and wooded area, you’ll come to a fork in the pathway – the left will take you under St-Joseph Boulevard towards the Gatineau Park, while the right side will bring you up to the 105. You turn right onto the 105 to head north. 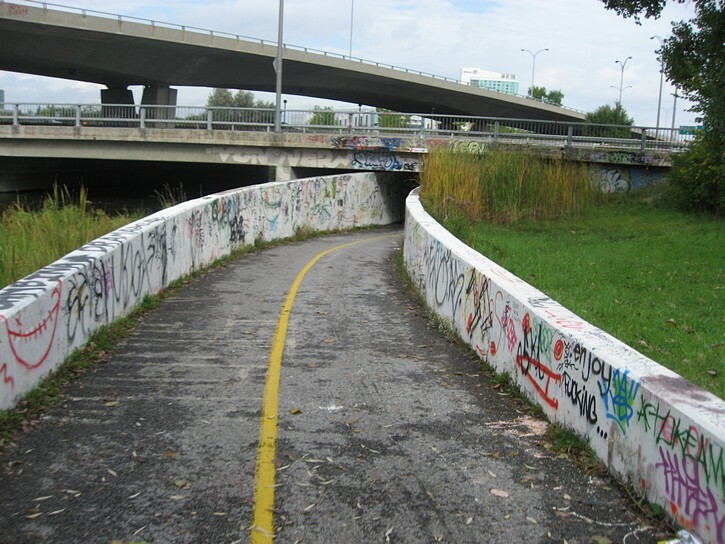 Initially, you will ride on a nice pathway that was in the process of being built in 2009, and which parallels the 105. Depending on how much progress they have made in building this path, you may also have to cycle a short distance (a few hundred metres) along the road where there is no path or shoulder of any kind. Whatever the case, this situation doesn’t last long, and you’ll soon find yourself on the 105’s paved shoulder. 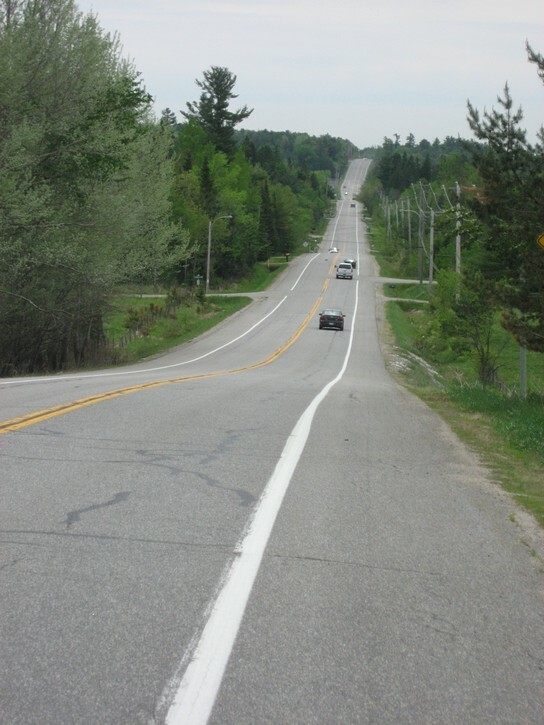 For the next 10 kilometres the condition of the paved shoulder ranges from reasonable to barely acceptable. There can also be a fair amount of traffic along this stretch of the 105, especially the during rush hours in the area where the Alonzo-Wright Bridge crosses the Gatineau River. Cyclists coming from the west end of the National Capital Region may be interested in starting this ride by cutting through the Gatineau Park. Although the instructions for this route may sound complicated, it is easy to figure out once you’re there or by taking a quick look at the NCC bicycle map. Start by following the route you normally take to go to the Champlain Lookout. About half a kilometre before Pink Lake hill, turn onto a path on the right side the Parkway (there’s a sign post for the “Relais plein air” and “Asticou”). In about 100 metres there is a T-intersection where you will turn left. This portion of the path used to have crushed stone surface, but it is now paved. It’s a pleasant path that is surprisingly flat, and it will lead you to Chemin de la Mine. Here you turn left, and cycle about 2 km on Chemin de la Mine. Although it doesn’t have a paved shoulder, this is a relatively quiet street that skirts the edge of Park. At the end of Chemin de la Mine turn right onto Notch Road. 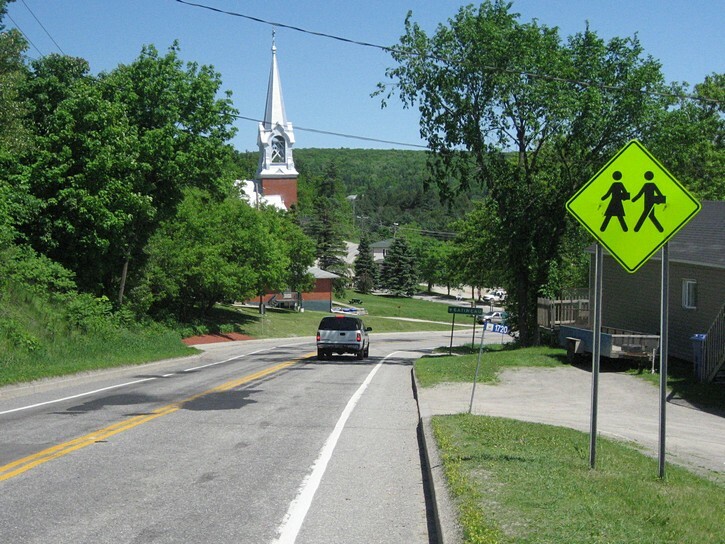 It doesn’t have a paved shoulder, but Notch Road it is fairly wide and not too busy outside of the rush hour periods. At the end of Notch Road, turn right onto Kingsmere Road. Continue to the end of Kingsmere, and then on Scott Road until you reach the 105. For all practical purposes Kingsmere Road and Scott Road are a continuation of one another. They are offset by a 50 foot jog, where you have to cycle a very brief distance on Old Chelsea Road. 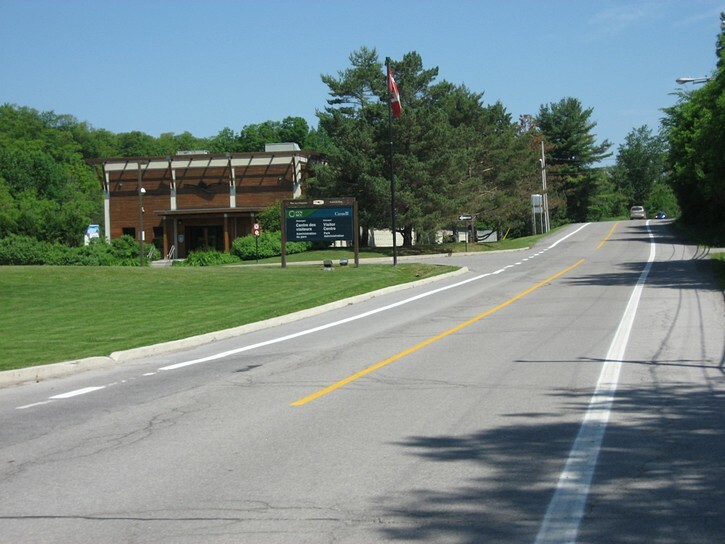 As you head towards the end of Scott Road, you’ll ride by the Gatineau Park’s official Visitor Center and pass under AutoRoute 5. You will also notice that Scott Road has a very nice bicycle lane. In certain areas, it is demarcated with plastic posts, a very effective way of ensuring that motorists see and keep off the bicycle lane. When you get to the T-intersection with the 105, turn left. After riding about 10 kilometres, the 105 seems to take on an entirely different personality. Traffic becomes noticeably quieter, and the scenery is a little more relaxing and interesting. This section of the 105 has been rebuilt in recent years, and as a result, the paved shoulder in this area is in excellent condition. 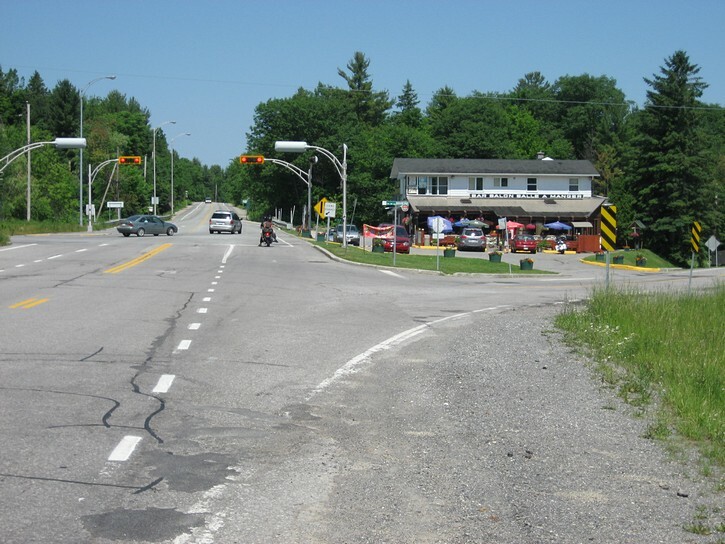 In another 10 kilometres you will arrive at the point where the 105 meets Scott Road (there is a flashing amber light and signs for Old Chelsea). 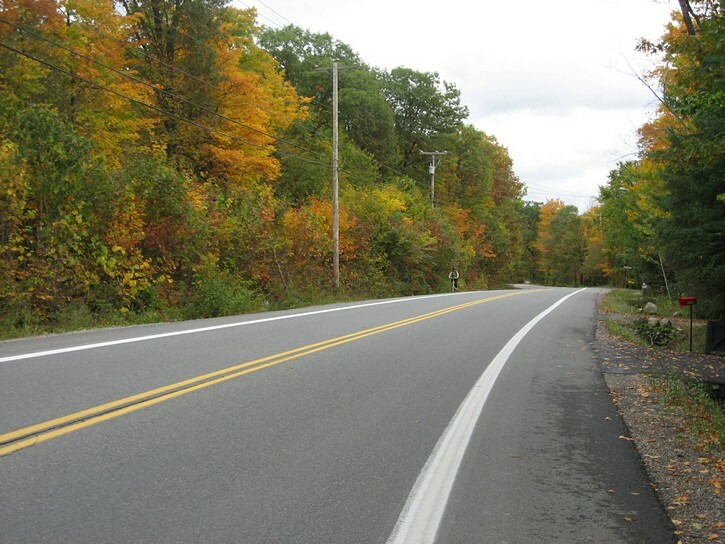 This is noteworthy because Scott Road is one of the main routes in or out of the Gatineau Park. 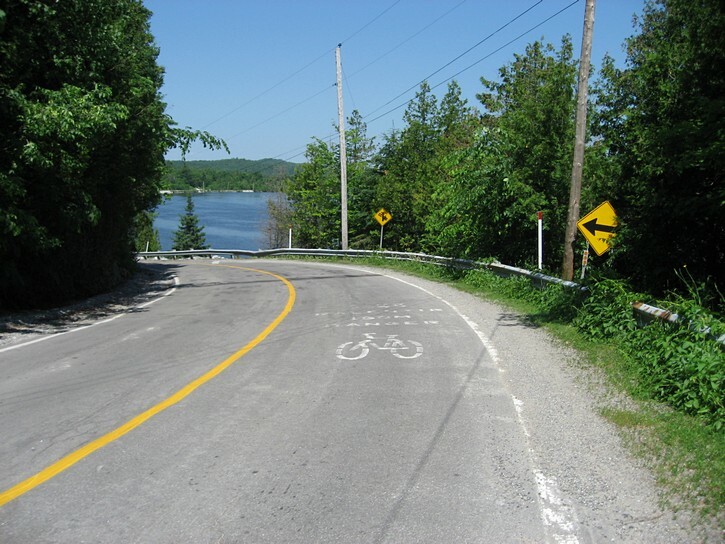 Cyclists from the west-end of town can also get to this point by cutting through the Gatineau Park (see the side bar for more details). As you continue along the 105, you will be riding on the part of this highway that, until recently, had asphalt that was in very poor condition and no paved shoulder. All this change late in 2015 when this segment of the 105 was resurfaced and a paved shoulder was added. This is a major improvement for anyone wanting to cycle to Wakefield. Moreover, despite the regular flow of vehicles, this part of the 105 isn’t too busy because most of the region’s traffic is drawn onto Autoroute 5 (a major limited access four lane highway). Eventually you will come to major a intersection, complete with traffic lights and a restaurant/bar/motel establishment on the right. This is the area where Autoroute 5 used to come to an end, and all of its traffic would dump onto the 105 at this intersection. Autoroute 5 was extended late in 2009, and it now dumps all of its traffic onto the 105 just north of Wakefield. It’s also at this location where you’ll have to make a decision about your final leg to Wakefield. You can simply continue on the 105 for the next 9 kilometres. This route is pleasant enough and it has a good paved shoulder all the way. When you get to the traffic circle, turn right on Chemin de la Vallée de Wakefield, and you’ll soon be right in town. Your other option is to get off the 105 by turning right onto Chemin de la Riviere (River Road). The main reason for taking this route is because it offers some great scenery. Up to this point, you will have only caught the occasional glimpse of the river when riding along the 105. By comparison, you’ll often be right next to the water when cycling along Chemin de la Riviere. Unfortunately, there are a few disadvantages with this road. Soon after getting on it, you will hit a couple of good hills (the rest of the route is very flat). But the biggest problem with this road is that the condition of its asphalt surface ranges from merely okay, to downright awful. It should also be noted that Chemin de la Riviere has no paved shoulder, but this shouldn’t be much of a concern since traffic tends to be very light. 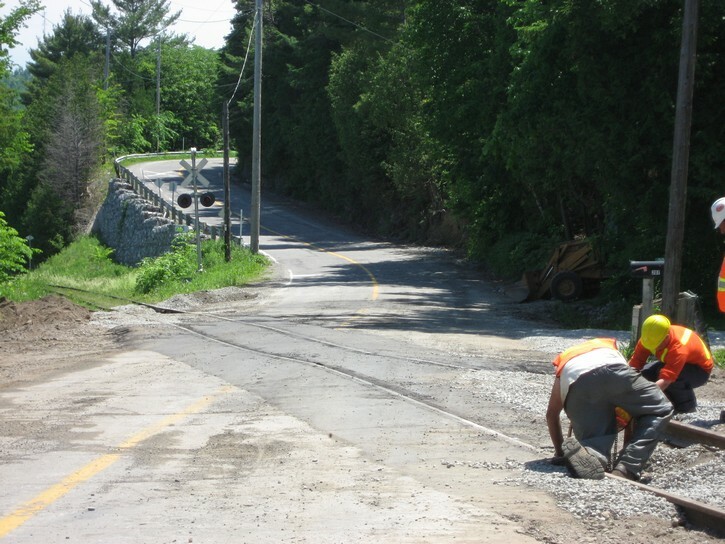 There is one major danger waiting for cyclists on Chemin de la Riviere. After cycling about 3 kilometres, you’ll arrive at a point where a railroad crosses the road at an oblique angle at the bottom of a fairly steep hill. Needless to say there have been many wipe outs here as the railroad track grabs the front wheel of unsuspecting cyclists. The dangerous situation is made worst by the fact that the railroad does not become visible until one is half way down the hill (and cyclists are distracted by their first great view of the Gatineau River). Road signs indicating that cyclists should dismount and walk their bikes provides advance warning of the hazard which lies at the bottom of this hill. In terms of scenery, the remaining 6 or 7 kilometres is probably the most nicest part of this ride. You’ll be cycling on flat terrain right next to the river wheer you will pass by a smattering of cottages and homes. Chemin de la Riviere leads right into Wakefield and becomes the town’s main street (also known as Riverside Drive). 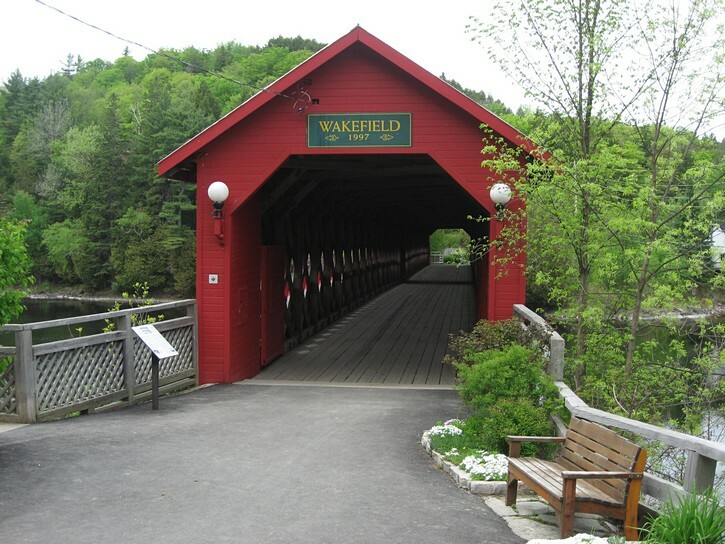 As you approach Wakefield, you get a good view of the covered bridge mentioned at the beginning of this article. Wakefield’s downtown area is approximately a kilometer long, but it very narrow. It is laid out almost entirely along its main street, and many of Wakefield’s buildings face the Gatineau River. 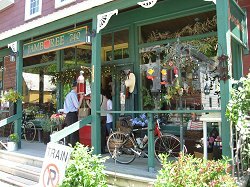 This is where you will find most of what the town has to offer, with the exception of the Wakefield Mill Inn, which is located a little less than half a kilometre up Mill Road. 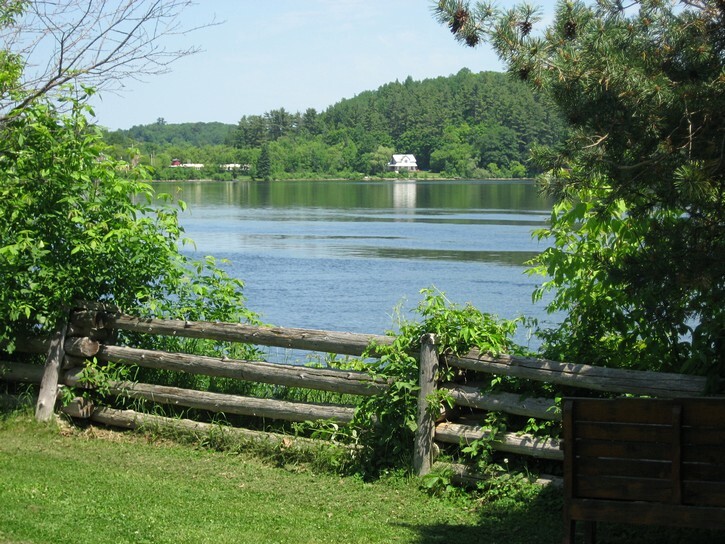 There is a small park and a few other places where cyclists can stop for a rest or to grab a quick snack on the narrow strip of land between the town’s main street and the banks of the Gatineau River. Backtracking on the route described above is the shortest and easiest way to return to downtown Ottawa/Gatineau. 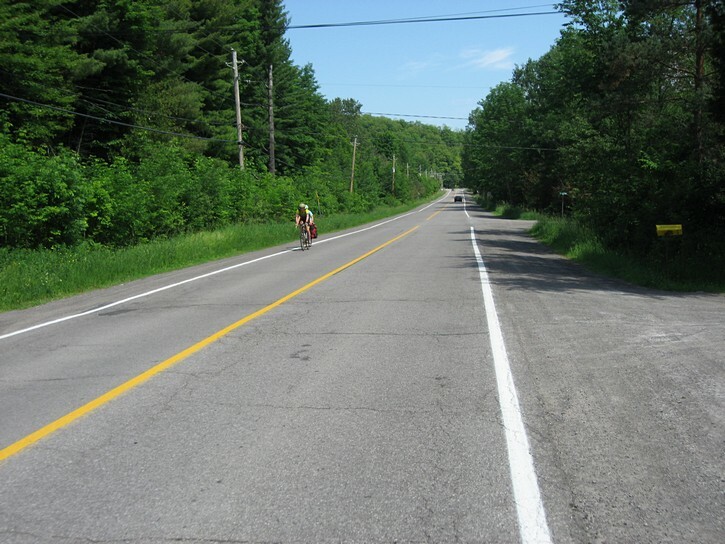 However, if you don’t mind a route that will involve some hilly terrain and add five kilometres to your ride, your could return on the east side of the Gatineau River by cycling along Highways 366 and 307. The good news is that you’ll be able to ride this entire route on a nice paved shoulder. To take this route, you’ll have to cross the Gatineau River just north of Wakefield. Use the cover bridge, which is only open to pedestrians and cyclists, or the regular bridge a few hundred metres further north. (Turn right onto Gendron Street to get to the covered bridge). The regular bridge will automatically lead you to Highway 366. 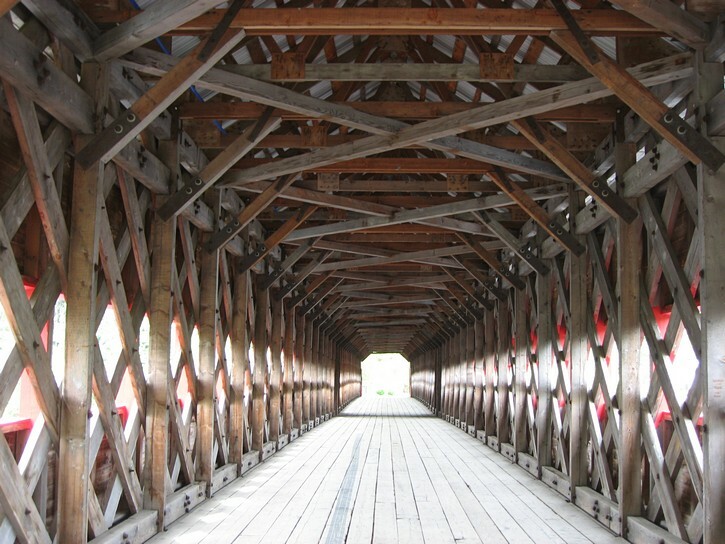 If you take the covered bridge, you’ll end up on Chemin du Vieux-Pont, which leads to the 366. The scenery along the 366 generally consists of rolling countryside, but this also means you’ll have to climb a good number of hills on this secondary highway. On week days there can be quite a few dump trucks on the 366 because there are several gravel and sand pits in the area. After about 13 kilometres, you come to the point where the 366 intersects with secondary highway 307. Here you’ll turn right and head south on the 307. Highway 307 can also be hilly, and while there is some climbing to be done, you’ll enjoy more descents when heading south on this road. 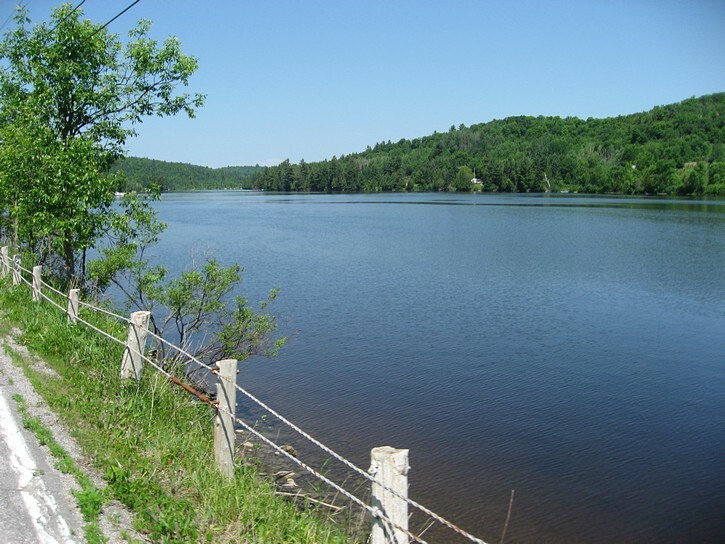 After cycling for 15 kilometres, you’ll arrive at the part of the 307 which runs right next to the Gatineau River. 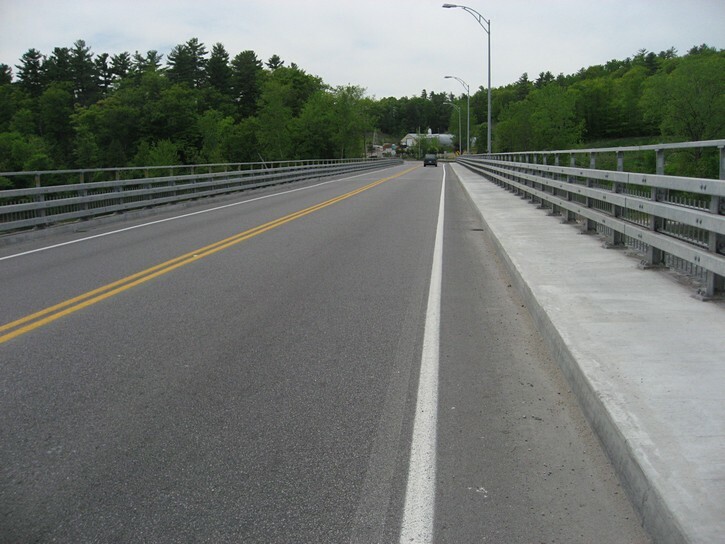 A few more kilometers later, turn right onto Alonzo-Wright Bridge to cross the Gatineau River and get to Highway 105. From here you’ll be able to backtrack on the route you originally took when heading to Wakefield. Note that Alonzo-Wright Bridge has a relatively narrow 2 foot paved shoulder, and that it can be very busy during rush hours. If you are feeling a little adventurous and a bit brave, there is still another route you can take when from returning Wakefield. This one will add 60 kilometres to your ride, involve more hilly terrain as well as a busy road with no paved shoulder. Take the 366 as described above, but when you get to the 307, turn left and head north for approximately seven kilometres (note this part of the 307 has no paved shoulder and can be quite busy). 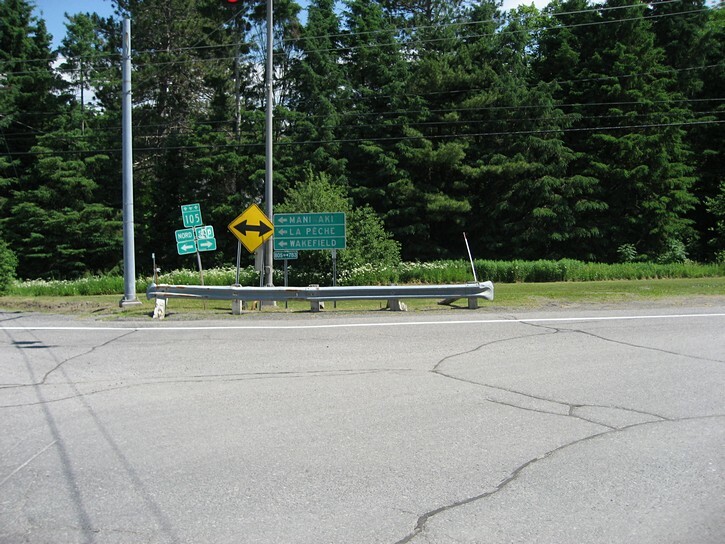 When you reach another section of Highway 366, (known as Route Du Carrefour) turn right. This part of the 366 runs around the north side of Lake McGregor, then veers towards the south, passes through the small town of Perkins, and continues all the way to the Ottawa River (about 30 km). There is no paved shoulder for the first 4 to 5 kilometres on the 366, but there is one from Lake McGregor onwards. The area around Lake McGregor is both very hilly and very scenic. There are one or two restaurants and convenience stores in Perkins. The landscape becomes a little more mundane and slightly less hilly after Perkins (and the paved shoulder may not always be in good condition). As you get close to the Ottawa River, you can use a combination of quiet roads and bicycle paths near the waterfront to head back to the downtown area of Gatineau/Ottawa.